It was not until the lights came on that Elizabeth Seng fully realized the significance of the moment. Behind her was a jumbotron. In front stood a multi-platinum singer-songwriter. Beyond him was a crowd of thousands of people. Seng, a senior psychology major at Penn State Behrend, has made many memories in her four years at the college, but performing alongside Barry Manilow as part of the Choirs of Penn State Behrend might take the cake. 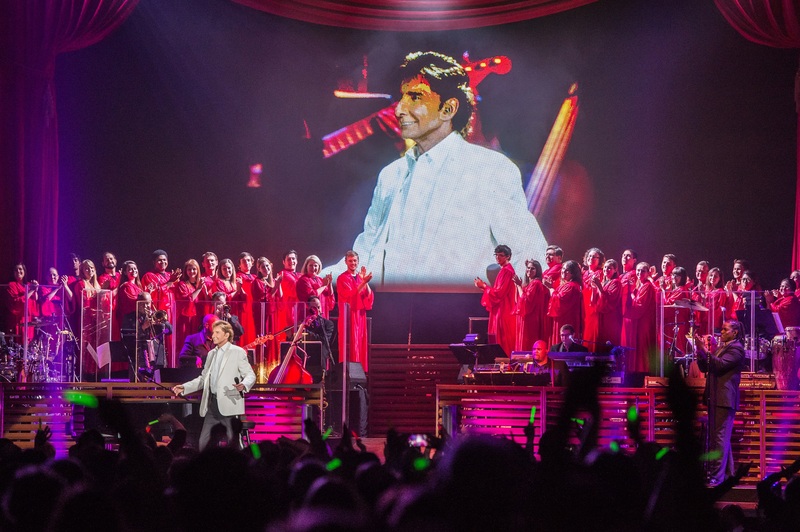 Manilow invited the Behrend Choirs to perform alongside him at his April 25 concert at Erie Insurance Arena. Tone-Acious, Penn State Behrend’s student a cappella club, joined the choir for the performance, which was part of Manilow’s “One Last Time!” tour. The day of the concert, the choirs arrived at the arena at 3:30 p.m. and practiced before going on stage at 9:30 p.m.
To honor the occasion, choristers created “Behrend Hearts Barry” t-shirts which they wore under their gowns during the concert. They even gave an extra t-shirt to Manilow as a memento. The shirts are a reminder of what was truly a once-in-a-lifetime experience for many of the choristers.